There are five improvements coming on the new 2019 Subaru Forester. See how consumers get a better small SUV. 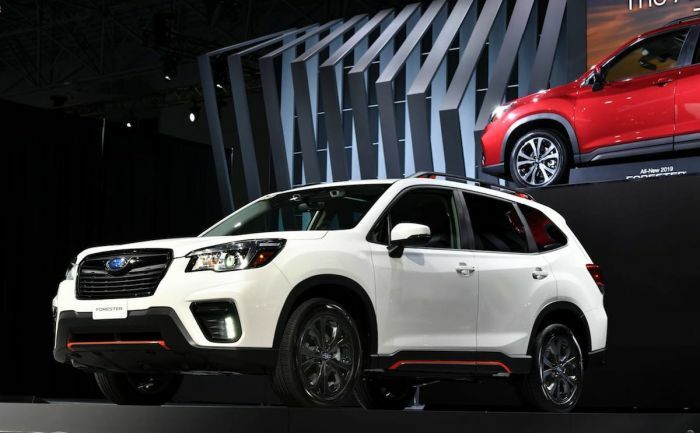 Even though the all-new 2019 Subaru Forester didn’t get dramatic exterior design changes, the new SUV gets significant improvements making it a better small SUV for consumers. It starts with the new Subaru Global Platform. The 2019 Forester is the third model in the lineup to get the new architecture. The fifth-generation Forester rides on the new underpinnings that should deliver a quieter cabin, improved ride comfort, greater agility and better crash protection. It gets the same underpinnings as Impreza and Crosstrek which translates to a lower center of gravity for improved driving dynamics. The new architecture underpinning the 2019 Forester will be 70 percent more rigid which translates to reduced vibrations and a smoother ride, and the new platform will reduce body roll of the vehicle by 50 percent compared to present models. An increase in the amount of high-tensile steel panel materials offers improved collision safety and a lighter body. All 2019 Forester models get a newly-enhanced 2.5-liter horizontally opposed four-cylinder Boxer engine. Subaru Corp says the new engine features around 90 percent new components compared with the previous 2.5-liter engine and introduces direct injection, improving horsepower and torque (182 hp and 176 lb-ft of torque, vs. 170 hp and 174 lb-ft in the previous Forester), while also providing a boost to environmental performance through improved fuel efficiency. Subaru did not release fuel-mileage estimates. Some trims get a new seven-speed manual mode of CVT, a new SI-Drive control, with the new Sport model getting S# (Sports sharp) mode allowing the driver to enjoy faster acceleration and direct-feel transmission shift. The cabin of the new Forester gets more comfortable for consumers with more overall space and more leg room in the back seats. Subaru engineers “optimized” rear door opening angle opening area, and C-pillar shape, improving back seat accessibility. A maximum rear liftgate opening width of 51.2 inches (1,300 mm), is larger than average for a mid-sized SUV, providing an increase in loading capacity. The drive unit for the power rear gate has been integrated with the gate stay offering more cargo storage space. Forester is the first Subaru model to get it. DriverFocus provides support for the driver by providing a warning when it detects signs of distraction or drowsiness at the wheel. The safety system uses facial recognition software to identify signs of driver fatigue or driver distraction. No other small SUV offers this technology and it’s a segment first for the brand. DriverFocus works with Subaru’s EyeSight driver assist technology all with the purpose of reducing accidents. The system will also automatically adjust driver settings for seat position, door mirror angles, and air-conditioning preferences at startup. DriverFocus can recognize up to five drivers. The new safety technology will be standard on top-of-the-line Forester Touring trims. All Forester trims will come standard with Subaru’s EyeSight driver assist safety technology. Other upgrades include Forester’s Reverse Automatic Braking helping to avoid collisions when reversing and reduces the damage in case of collision, Rear Vehicle Detection system detects vehicles approaching from the rear, Steering Responsive Headlights provide clear nighttime vision, and High-beam assist improves visibility when driving at night. Subaru of America sold 177,563 Forester SUVs in 2017 and it’s the brand’s second-best-selling vehicle, behind the Outback. The new Forester is forecast to deliver about 26 percent of the brand’s U.S. sales going forward making the all-new 2019 Subaru Forester a significant reveal for the brand’s U.S. performance. The fifth-generation Forester will hit U.S. showrooms in October 2018. As a current owner of a Forester I loathe the current situation of loosing the turbo option. This sadly will be my last Forrester. Perhaps the ascent . But it's really more than I need and as these are CVT I am deeply saddened that I see no other way forward but to look at another brand.. perhaps another Mazda.. CX-9?. Mercedes? I really appreciate the Forester's playful personality. Great car all the way around except for (and this is a big exception) Stop/Start technology :/ They should give us the option to disable it properly. The other reason is obvious: No turbo.